Hey All! Sorry for the hiatus. 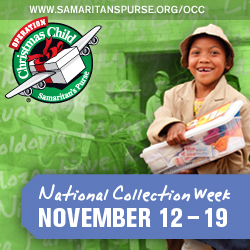 Besides the normal craziness of my busy life, I was sent to Georgia for the past couple of days covering the disaster relief Samaritan’s Purse is doing. I had a FANTASTIC time! Not only was it great because I’ve genuinely missed reporting in the field, but I met so many amazing people who volunteer their time regularly when disasters like these happen. They were truly inspiring. Also, I got to do my longest solo drive ever– 5 hours! Yes…yes… I know I’m a wimp. But I’m very glad I survived. Also, we ate tons of Southern food while we were there. My tummy is still not pleased with me for that one. I’ve never seen so much macaroni, meat, and mayo in my life. But seriously, the people who cooked for the volunteers were so sweet and generous. It was really great. Anywho, pictures speak louder than words, so when my boss said I could share some of my photos on my personal blog, I couldn’t help but give you all a sneak peek of what’s to come on http://www.SamaritansPurse.org. This was one of the first pictures I took and by far my favorite. 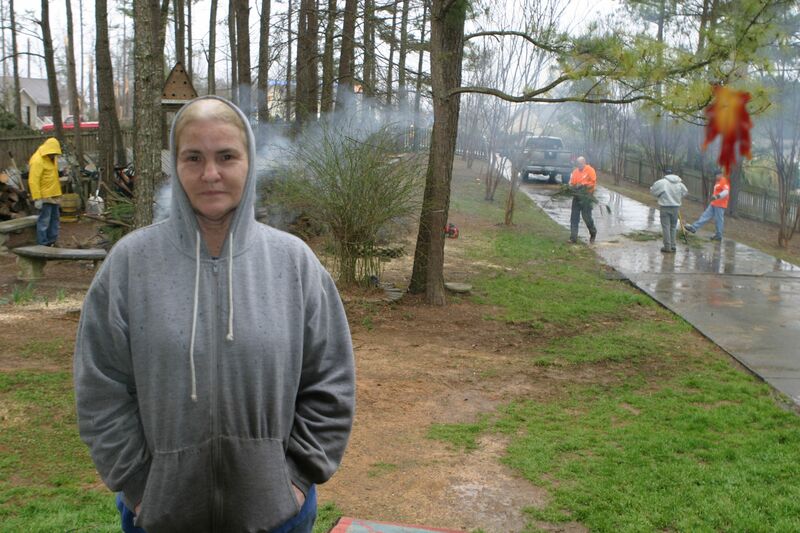 This woman had such a rough couple of months and the tornado was the icing on the cake for her. 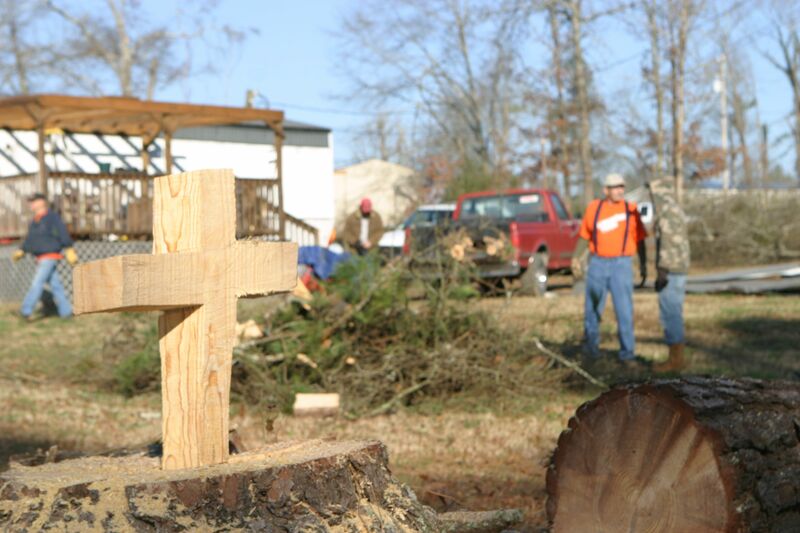 She had to be her father’s caretaker, hospice had to come in, he died, she had a stroke and then the doctor finally cleared her to start working again when the tornado hit the next couple of days. She figured she’d have to put off finding a job for another two weeks, maybe more, because of all the clean-up in her yard. 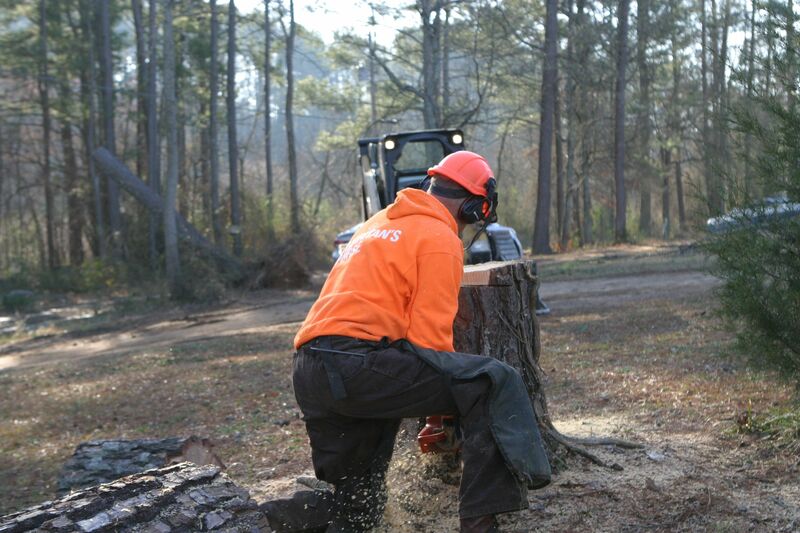 Instead, Samaritan’s Purse did all the cleanup, including cutting down dangerously weak trees, in two days. When I was taking this picture, she made a comment that she thought she looked terrible. I said, if she wanted, she could smile if she thought that would make it better. She replied, “Well, there’s not much to really smile about.” Then she paused. “Well, I guess there is now.” She still didn’t smile, but the pain in her eyes really moved me. This house doesn’t really need much description. 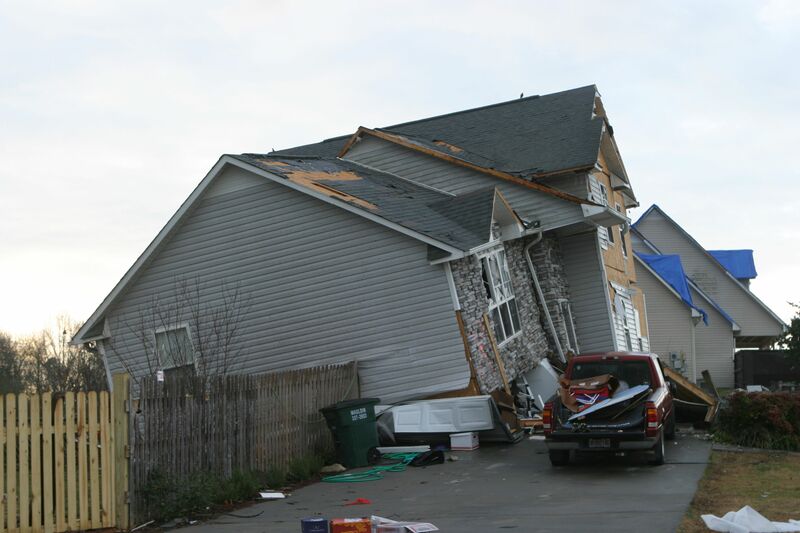 The house was literally picked up off of its foundation. Now, I know this is going to sound silly since it is such a simple picture, but I really love it. This guy was super cool (he climbed trees, cut them down, etc and could spot a weak tree from a mile away) and he was being interviewed with our broadcast team. I don’t like asking people for smiles because I don’t think the cheesy grin does anyone any good. So, while he was waiting for the camera and audio to be set up, I started taking pictures of him looking down and around and finally he turned to me and said “STOP!” before laughing hysterically. I was hoping I’d catch his natural smile and I did. The guys who cut down the trees would leave these to mark the yards. The homeowners really loved them. The guy with the chainsaw actually let me trace this one out. I did a terrible job and he tried to fix it. Oh well. Speaking of which, here’s him making it out of the stump! This is my buddy Larry who was insanely hard to photograph candidly because he always looked down when he walked. I even had him pose a couple of times, and some of them came out all right, but then I got lucky with this one after he was coming back from his truck. Larry was having a hard time trying to find the will to live the past couple of months as he was plagued with an intense depression. 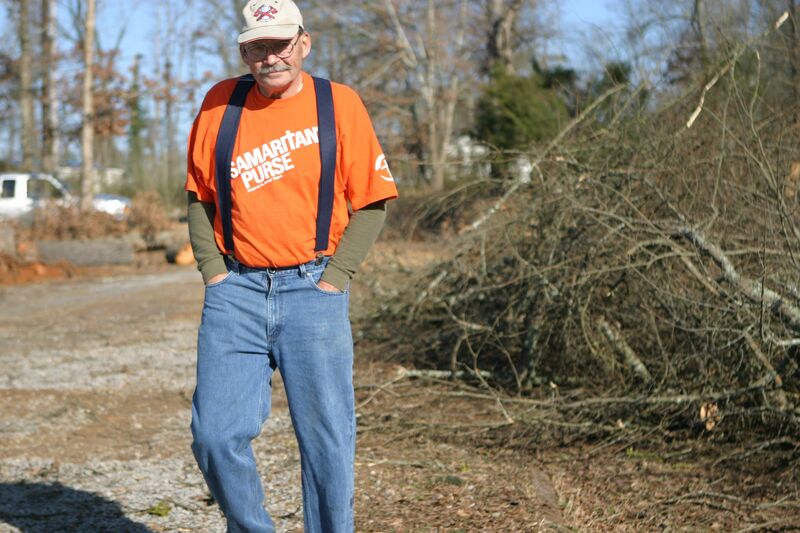 When Samaritan’s Purse came to help him and his neighbors, he wanted an orange shirt too. This man who could barely get out of bed by noon just last week has been meeting at the church around 6:30 a.m. to go out with the team and help other people in his community. He says God sent the tornado to pick him out of his depression and he feels like he’s alive again. 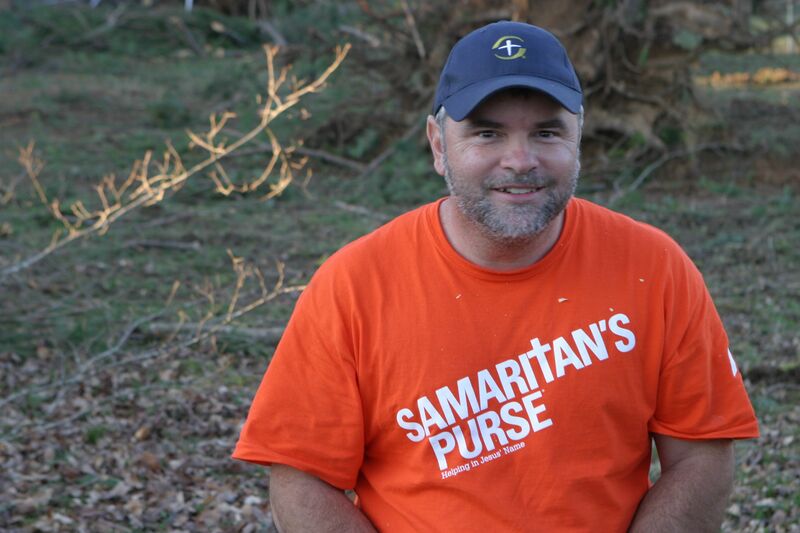 Even after Samaritan’s Purse leaves, he hopes he can continue helping people, quit smoking, and get back into church so he can be living the life he should have been living all along. I wrote a feature on this fella that will hopefully be out within the next couple of weeks. I’ll be sure to send it to you guys!